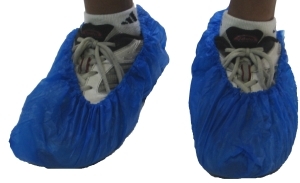 CPE B Blue Shoe Covers Case of 1000. Blue disposable shoe covers. CPE Polyethylene material. "B" grade. Elastic ankles. 10 bundles of 10 pieces each per poly bag. 10 bags per case. Made in China.